As students haul their favorite pillows and posters into the brand new Global Scholars Hall on East Campus come September, they may not pay much attention to the landscape around the building. They’ll be wowed by the roomy living spaces, state-of-the-art wireless, on-site performance center, and variety of dining options. Their parents will take happy note of the full-time, on-site librarian and the live-in faculty scholar. These days, the landscape architect often serves as project design manager. “They sort out the site and leave a bare spot to drop the building in,” Poticha says with a laugh. “They’re getting even.” Indeed, Cameron McCarthy orchestrated the design of PK Park (the UO’s new baseball facility) as well as the redesign of Hayward Field and the four nearby intramural student recreation fields. Exterior hardscapes merit equally careful consideration. Outdoor spaces must be welcoming and safe and should have central areas that are conducive to activity as well as quiet areas off to the side. They also need good circulation, with a front and back “door,” and should take advantage of the sun and provide shelter from the rain. 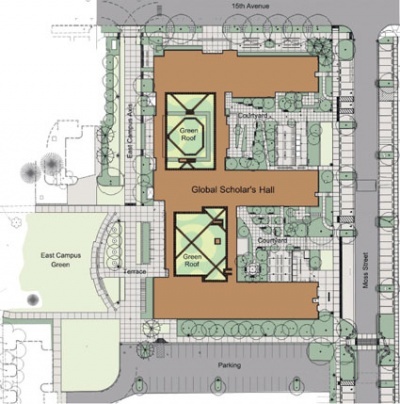 The Global Scholars Hall’s two courtyards are large and enclosed, with secured bike areas. One of them is connected to the dining area, so meals can be enjoyed outside on nice days. In a nod to today’s über-connected students, all the outdoor benches will have built-in power and data ports. The complex boasts the largest green roof on campus, at 10,000 square feet. The rooftop garden on the single-story section of the building (which will house the dining areas, classrooms, and other common areas) will be planted mostly with leafy four- to six-inch-tall sedums. This living blanket will help cool the building in summer and keep it warm in winter. It will provide a pleasing view for students in the residential towers, too. Cameron McCarthy incorporates into its projects natural materials such as stone or wood, reclaimed materials, and methods for draining storm water. “Our company is evolving to push the envelope of sustainability,” says Colin McArthur ’01, MCRP ’06, also a partner in the firm. Previous UO exterior design projects include the Living-Learning Center, the Lillis Business Complex, the Jordan Schnitzer Museum of Art, and the campus entryways at East 13th, 15th, and 18th Avenues, among others. The company currently has sixty to seventy active projects around the state. On the agenda at the UO right now are the reconfiguring of Moss Street near the child-care center, relocating the women’s soccer field, converting grass fields outside the Casanova Center to synthetic-turf practice fields, and the remodel of Allen Hall, as well as still-evolving ideas for redesign of the EMU and the Student Recreation Center. Crews are in the final stages of completing the three-tower, five-story Global Scholars Hall. Designed to improve the student experience by integrating academics into residential life, the hall will be home to 450 undergraduate students beginning this fall. It is the first new residence hall built at Oregon in five years, the second in the past four decades. Academics The hall will support classroom curricula and specific projects and programs for students seeking a comprehensive and scholarly academic experience, such as those enrolled in the Robert Donald Clark Honors College and honors programs in individual departments. 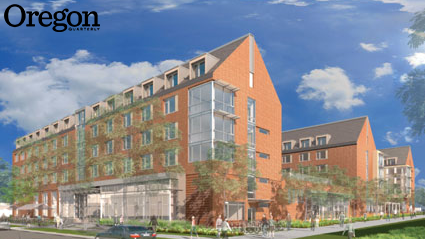 The hall will also serve foreign language majors and others seeking a language immersion experience.